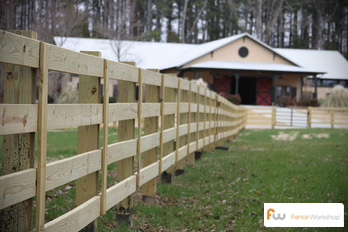 Looking for the right company to provide and/or install farm fencing for your property in Savannah, Gerogia? While Fence Workshop™ do not currently sell wood fencing materials to the public, we want to provide the best information to customers looking for all types of fencing so that they can make the informed decisions from materials to installation. 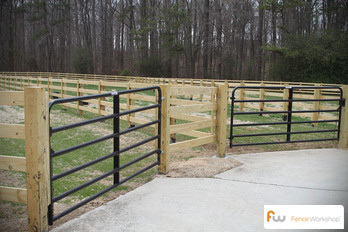 If you’re looking for Georgia farm fences for horses, cows, goats and other farm animals, read on for all you need to know to plan your project. Savannah has all the amenities of a big city, but the perk of being able to escape to the wide open proprieties, as well. The rolling hills and charming farms found throughout Savannah need practical fences, but they should be just as good looking as the area, too. A quality fence installer will match the gorgeous scenery found in the area, and build a reliable fence that is both safe and sturdy. Because of our past experience as professional installers, we understand just how curious animals can be around a new fence. Horses for example, will generally test a new fence by leaning and pawing against it. Therefore it’s important to choose quality materials and follow procedures and precautions to ensure your farm fence stand the test of time and curiosity of large animals. 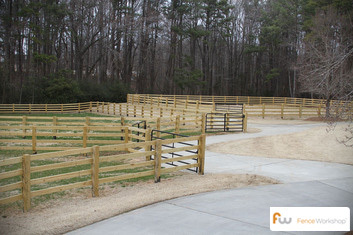 Why choose Fence Workshop™ for farm fencing in Savannah, Georgia? While we do not carry lumber for sale to the public, we do carry other options that can be used for effective farm fencing. We supply aluminum, vinyl, steel and chain link fencing in a variety of styles that may suit your farm property. We build our farm fences with your animals’ safety in mind, leaving no sharp wire edges, nails left on the ground or sections that animals could get tangled in. We Service Savannah, GA and surrounding areas like Valdosta, Macon, Columbus, and more.